SUPERB EXTREMELY RARE NORWEGIAN HENRIK MOLLER DRAGESTIL SOLID SILVER 830 PAPER KNIFE LETTER OPENER FABULOUS DOUBLE SIDED FIGURAL FINIAL OF VIKING NORSEMAN HEAD - TRONDHJEM NORWAY - SILVER WEIGHT c50g - HIGH QUALITY - GOOD CONDITION - HIGHLY COLLECTABLE - GREAT GIFT! 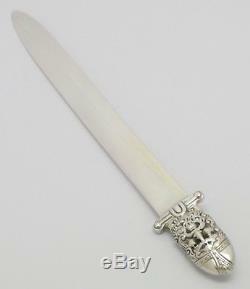 On offer is this extremely rare Norwegian solid silver grade 830 paper knife/letter opener. What makes this piece very special is its super design and the high quality maker, Henrik Moller (1858 to 1937), who is generally better known for his beautiful silver jewellery. On this piece, the finial has been crafted in lovely detail in the'Dragestil' style. It is modelled as a double sided figural Viking Norseman's head - please see the photos and, in our opinion, they do not do it justice. Dragestil' is a Norse revival style of the Arts & Crafts movement, so popular in Great Britain around the late 19. Century period, by proponents such as the famous William Morris. In Norway, this drew on inspiration from the Viking era and early medieval images. Henrik Moller drew on designs from his native town of Trondhjem (Trondheim) found on early architecture. 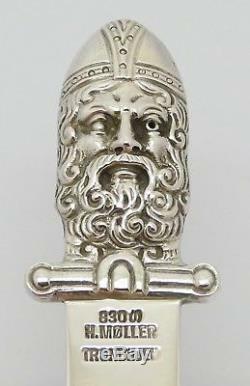 The entire piece has been case in solid silver, grade 830, not just the terminal. In good condition, you can imagine what a wonderful, rare, unusual addition this would be to any collection of Norwegian silver, particularly by the highly collectable, Henrik Moller. And can you imagine a more stylish way of opening your letters? 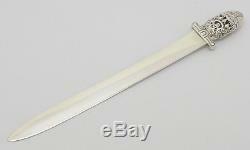 It measures 19.5cm in length and weighs just under 50g. As noted, it is in good condition and ready for use. Dark marks are either reflections or bits of age related patina. 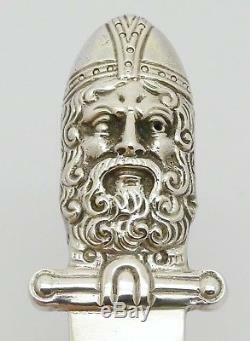 This is an extremely rare piece of Norwegian solid silver grade 830 in the form of a letter opener/paper knife by the highly collectable Henrik Moller of Trondheim, Norway, in the Dragestil, with a double sided figural terminal of a Viking Norseman's head. Whilst you are here, why not take a look at our other lovely pieces of solid silver? We specialise in high quality silver items that carry the hallmarks of solid English silver. We have many collectable silver pieces of different eras and styles antique, vintage and modern from before Victorian times to Art Nouveau, Edwardian, Art Deco and all decades up to the present day. 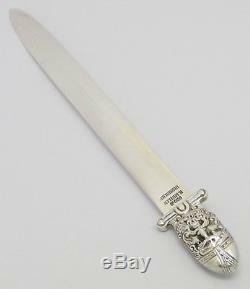 We also have various, assorted English silver items to offer in lots. If you are looking for a specific English silver piece, please let us know and we will try and find it for you. We also occasionally have on offer high quality silver pieces from around the world. Please check our page regularly for new items. Please let us know as soon as you have received the item if you wish to return it. Then you can simply return the item within 14 days in the same state in which it was received. Please note that we take extra photos of items for our records prior to sending to show condition. We do not give discounts. 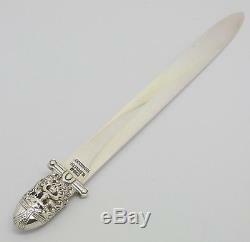 The item "SUPERB H MOLLER NORWEGIAN SOLID SILVER 830 DRAGESTIL PAPER KNIFE LETTER OPENER" is in sale since Saturday, July 21, 2018. This item is in the category "Antiques\Silver\Solid Silver\Other Solid Silver". 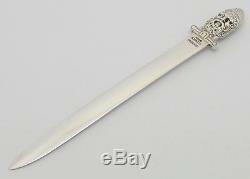 The seller is "simplyenglishsilver" and is located in London. This item can be shipped worldwide.